She was one of the head nurses in the ship's sickbay, assigned there in 2367 as an ensign. Nurse Ogawa helped Dr. Crusher develop a way to stop the metamorphosis of the Tarchannen III aliens in 2367. She was also present during several surgeries involving the Trill ambassador Odan, which were the first Federation observations of the Trill symbiont. Alyssa was one of the many crewmembers to fall victim to the psychotrophically addictive effects of the Ktarian game when it was introduced to the Enterprise. She was the nurse on hand for the first use of the genetronic replicator, during the risky surgery on Lieutenant Worf's spinal column. Ogawa brought several pieces of medical equipment to the Enterprise bridge in order to monitor Captain Jean-Luc Picard's condition while he was knocked unconscious by a Kataan probe in late 2368. Ogawa briefly dated a fellow Enterprise-D crewmember in 2368. They took a holodeck trip to the Champs Elysees, and he invited her to Risa. Ogawa wasn't sure if she was ready for the uninhibited atmosphere of that planet, and Dr. Crusher suggested Tavela Minor as an alternate destination. In 2369, Ogawa assisted Dr. Crusher in performing an autopsy on Joshua Kelly, an engineer from the USS Yosemite. Shortly following this incident, she helped treat Deanna Troi after she became a receptacle for Ambassador Ves Alkar's psychic "waste." Ogawa took part in the relief effort to Tagra IV in 2369. She helped Amanda Rogers pack a shipment of tricorders for transport to the planet. Ogawa helped investigate the mysterious deaths of Doctors Jo'Bril and Reyga in 2369. Ogawa risked her own career when Dr. Crusher was relieved of duty for performing an autopsy on Dr. Reyga, violating the Ferengi death ritual and the Prime Directive. Crusher wanted to continue investigating, and was unable to access the needed autopsy files. Ogawa used her authorization to provide Crusher with the information, realizing that the vindication of Reyga and his work on the metaphasic shielding was very important to Crusher. Ogawa dated Ensign Markson in early 2370, a relationship which became the subject of gossip between Dr. Crusher and Captain Picard. Ogawa was one of the few junior officers who knew of the Cardassian defector Joret Dal's presence aboard the Enterprise, as she helped Dr. Crusher treat his serious injuries. She was ordered not to discuss what she knew of Joret with anyone. Upon recommendation of Dr. Beverly Crusher, she was promoted to lieutenant junior grade in 2370. Ogawa began seeing Lieutenant Andrew Powell later that year. Around the time of midyear crew evaluations, Alyssa worried that she and Andrew were growing apart. He began putting in many overtime hours and the couple did not spend much time together. However, Andrew proposed to her, much to her surprise and delight. They announced the engagement after the evaluations. In 2370, Ogawa treated Commander William T. Riker's back after he had rolled onto Cypirion cactus during a date with Rebecca Smith. The couple conceived a child shortly thereafter. The baby saved the life of the entire Enterprise-D crew when the ship was ravaged by Barclay's Protomorphosis Syndrome. Commander Data was able to extract natural immune barriers in the amniotic fluid from the pregnancy, which was used to cure the condition. During the crisis, Ogawa de-evolved to a lifeform resembling a primate. She gave birth to the child, a boy named Noah, in 2371. She also helped evacuate sickbay and care for injured crewmembers following the crash of the Enterprise-D saucer section on Veridian III in 2371. 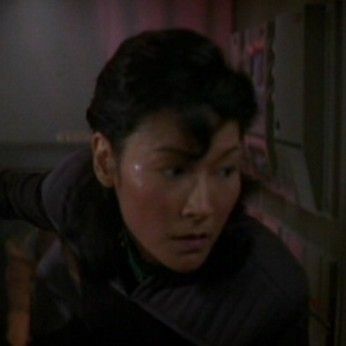 Ogawa was promoted to full lieutenant by 2373 and was posted to the new USS Enterprise-E. During the ship's trip to 2063, she helped evacuate sickbay after the Borg began to overrun the ship. Following Andrew's death, Alyssa and Noah became very close to Enterprise shipmate Ranul Keru, who had suffered a similar loss. Noah came to consider the Trill to be an uncle. In 2379, Ogawa and Noah transferred to the USS Titan during its exploratory mission of the Gum Nebula, where she served under chief medical officer Shenti Yisec Eres Ree.